This shingle style home showcases historic flair with modern amenities. Sweeping eaves and clipped gables add character, while cedar shakes add rustic appeal. 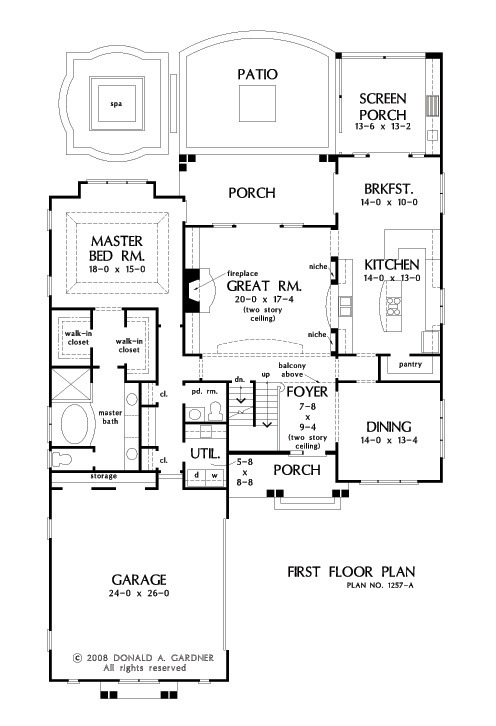 Inside, the floor plan offers custom-styled details including built-ins, niches and soaring ceilings. The large gourmet kitchen features expansive counter space and a walk-in pantry for the family chef. A pass-thru from the kitchen to the great room adds convenience and maintains the flow of the open floor plan. The main level master suite includes two large walk-in closets and a spa-like bathroom. Upstairs, two more spacious, private bedrooms offer walk-in closets and adjacent bathrooms. A bonus room over the garage and a large storage closet complete the second floor. 1st Floor: 2069 Sq. Ft.
2nd Floor: 724 Sq. Ft.
House Dimensions: 58' 0" x 88' 8"
Great Room: 20' 0" x 17' 4"
Master Bedroom: 18' 0" x 15' 0"
Deck / Patio : 14' 0" x 14' 0" x 0' 0"
Dining Room : 14' 0" x 13' 4" x 9' 0"
E-Space : 7' 8" x 4' 0" x 9' 0"
Foyer (2 Story): 7' 8" x 9' 4" x 18' 1"
Garage Storage : 14' 4" x 2' 0" x 0' 0"
Great Room (2 Story): 20' 0" x 17' 4" x 18' 1"
Kitchen : 14' 0" x 13' 0" x 9' 0"
Balcony : 11' 8" x 6' 0" x 8' 0"
Bedroom #2 : 14' 0" x 11' 4" x 8' 0"
Bedroom #3 : 14' 4" x 11' 4" x 8' 0"
Bonus Room (Vaulted): 14' 3" x 26' 3" x 8' 0"
Breakfast Room : 14' 0" x 10' 0" x 9' 0"
Master Bedroom (Tray): 18' 0" x 15' 0" x 9' 0"
Patio - Rear : 21' 6" x 17' 0" x 0' 0"
Porch - Rear : 21' 6" x 9' 8" x 0' 0"
Porch - Front : 14' 8" x 6' 0" x 0' 0"
Porch - Screen : 13' 6" x 13' 2" x 9' 0"
Storage (1st Fl.) (Sloped): 3' 2" x 3' 8" x 0' 0"
Storage (2nd Fl.) : 5' 8" x 5' 4" x 8' 0"
Utility Room : 5' 8" x 8' 8" x 9' 0"